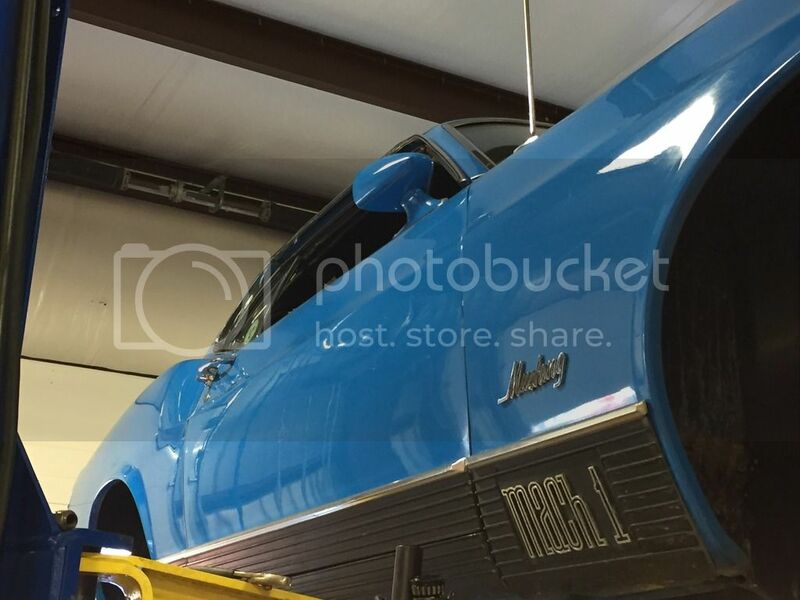 I bought a 1970 Mach 1 last weekend , and it is in the shop getting some work done before I pick it up (adding factory power steering, power disc front brakes, new clutch, detailing, etc.). I traded in my 2008 GT500, so it is bittersweet (I still have my 2013 GT500, though, so I figured a new and old would be cool). I spoke with the service manager yesterday, and they found a small leak in the radiator, so they are sending it out to have it pressure tested and repaired/replaced (depending upon how the test comes back). My question is this: While they are working on the car, should I go ahead and add Vintage Air A/C? It sounds like they are going to want around $3500 installed. My only concern is that I don't want to create any problems with the car, such as engine overheating, etc. And, if I do get the A/C, should I also have them go ahead an upgrade the radiator? If so, what type, and should I have them paint it black? What about an upgraded cooling fan? Thanks for any suggestions and feedback!! Why not upgrade the radiator either way? Install the larger radiator now and if you decide to add a/c down the road you wont have to change the radiator again. If you don't end up adding a/c you'll have the extra cooling benefits of the larger radiator. Put the Vintage Air in. You will enjoy it. Upgrade the radiator to at least having it made a triple core unit for better heat displacement. A/C was option 5 years on the Mach 1 and it survived. If you put in a good re-cored radiator (original or aftermarket) you should be fine without additional electric fans, etc. You should be able to get the radiator re-cored, saving the original upper and lower tanks with their date codes if some originality is important to you. Or else get a larger radiator made to fit. I would recommend also a good overflow tank such as the newer metal cylinder ones instead of the original plastic one that will crack and leak. With the new A/C you will enjoy the summer time cruises a lot more. 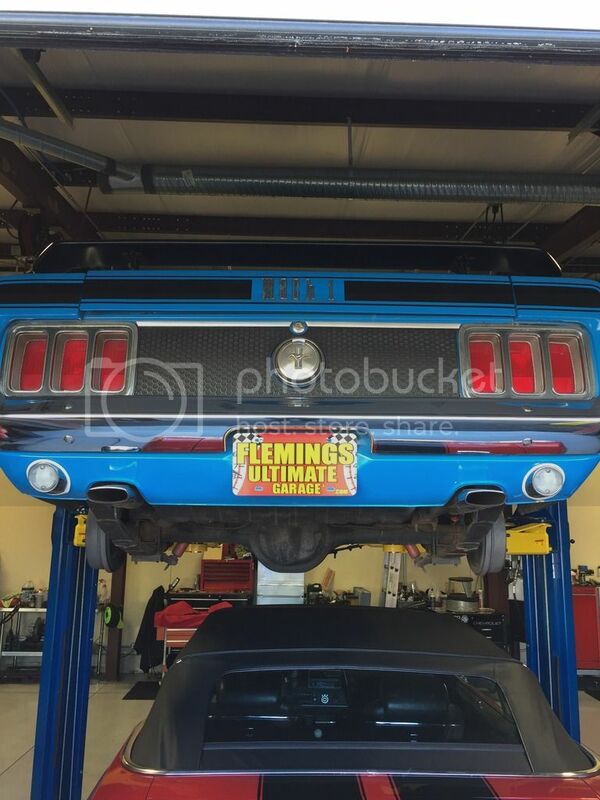 I take it this is a stock 351 Mach 1 as for the A.C if you are located in a warm climate & want to cruise a lot why not go for it, & as it was said up grade the rad regardless of whether or not you go with A.C. I would keep the old tanks & recore it ,paint it black to make it look more original. Good Luck. Any pictures? Makes sense. As far as keeping it original, that is why I'm debating, but I'm not a collector. I plan to use this as a cruiser. However, the shop was already in the process of upgrading the brakes and steering when I found the car. But, they are using factory parts to upgrade it to what would have been available. But it already has been changed so to speak. I'm not an investor planning to resell and make a profit. I just really like the car and want to enjoy cruising and tinkering with it. All that being said, the A/C upgrade isn't a factory system, but I don't know if a factory a/c system (new) is even available - I'm guessing not. The shop said repair or replace of the radiator, depending upon the test results and what the radiator shop recommends. They can replace it with a new "factory" radiator (black), which would be nice. I do want the car to appear mostly original wherever possible (I'm even going to get one of those radios that looks like an original but has modern guts). So I guess the main question at this point is - will the new factory radiator sufficiently handle the new A/C, or will the car run too hot and need an upgraded one because of the A/C? Yes, it is stock. Can't seem to get the photobucket site to work today, and I don't see a way to upload pictures directly. Anyone know how to do that? Am I overlooking something? Thanks. okay here are a couple of pics that I was able to take while it was on the lift. I'll take better pics later once the detailing is done! If by factory radiator you are talking about a two row radiator then yes the engine can possibly overheat when using a/c depending on the driving circumstances. If you are talking about a three row radiator then you should be ok with or without A/C. In my opinion the A/C is a mute point. Unless you're seeking a 100 point restoration scenario you should always go with a h/d radiator. Very little cost difference between a 2 row vs 3 row radiator. And just so everyone is on the same page I'm talking about replacement brass/copper radiators and not aftermarket aluminum radiators. Okay, so does this car have a 2 row or 3 row from the factory? I don't know much about radiators. If it came with a 2 row, then you are suggesting to replace it with a high performance radiator (i.e. 3 row), but not an aluminum one, correct? If so, do you have concerns with the aluminum ones? Thanks - appreciate your feedback. No concerns about aluminum radiators at all as they are actually a superior product but you seemed to want something stock/OEM looking which an aluminum radiator is not. Have no idea what radiator your car currently has. We don't know if it came from Ford with a hd cooling option and we also don't know if its been changed during the last 47 years. If you want the maximum amount of cooling go with an aftermarket aluminum radiator. If you want very good cooling go with a factory 3 row radiator no matter if you add a/c or not. If you want the minimum amount of cooling, that could possibly overheat if you add a/c, then go with a factory 2 row radiator. Thanks Steve - exactly what I needed to know to make the right decision. Really appreciate your input. Now I just have to decide if I really want them cutting holes in the dash etc! Beautiful car. 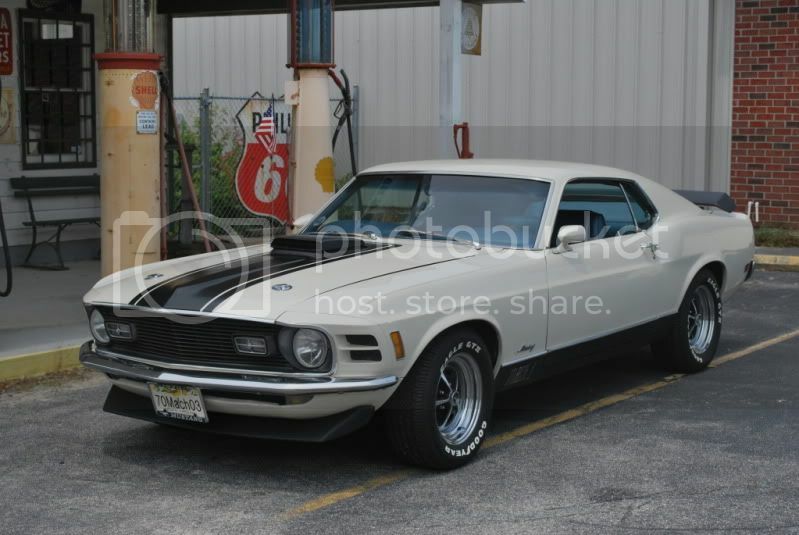 I have had a 1970 Mach 1 also for the last dozen years or so. Mine was an originally factory air car with a 351-4V M-Code and Shaker. Your question depends a lot on how much YOU value originality and how much you plan to drive it. Mine came with the original Ford A/C system and was not very efficient. When it came on, it felt like it killed 50 horsepower. Also my old system was prone to Freon leaks and after a while I finally gave up. Besides, I enjoyed riding with the windows down and the exhaust roar and intake noise from the Shaker was music to my ears. At first I just took the A/C belt off but I finally removed the entire system under the hood for a cleaner look (and removed about 50 pounds of dead weight). I'm not really concerned with originally but I like the original appearance. Mine was an automatic from the factory but a T-5 five-speed was added prior to my purchasing the vehicle. I added a Hurst type shifter to give it an original look too. The overdrive is one of the best moves you can add to a classic muscle car as I've gotten as high as 25 mpg on the highway. Around town is still in the 12 to 14 range like when it was stock. 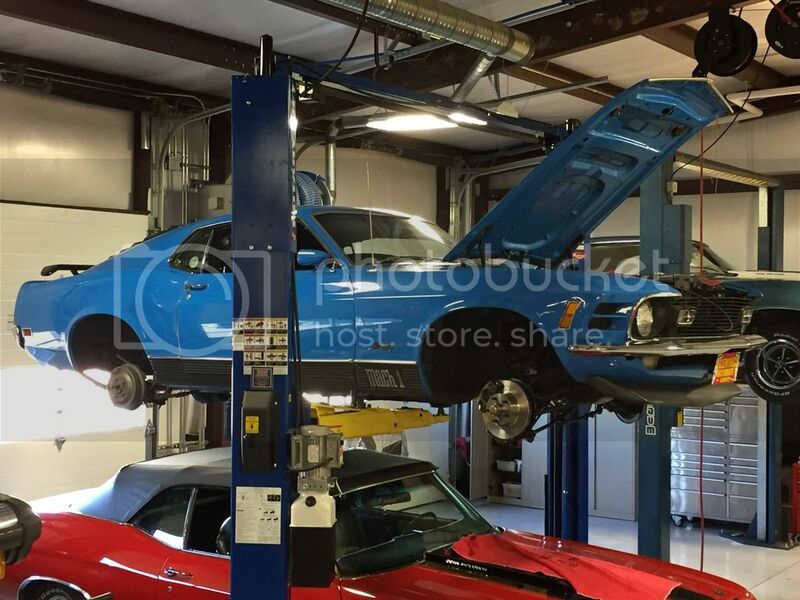 Many people I know have put the classic air type systems in their Muscle Cars and are happy. Again, it's what you want to do with it. Enjoy it, I do. Steve is correct about the radiator configuration. The original radiator is probably a Ford two row (double core) unit. Take it to a reliable radiator shop and the can remove the upper and lower tanks and re-core it with a triple row making a better cooling unit. They will be using new copper so and paint so your radiator will be better than many of the lessor quality aftermarket units. They will reassemble using your original date coded tanks and frame so it will go back in yo9ur Mach 1 perfectly. Vintage and Classic Air both make some fairly easy to install units. If this is a first time install, it takes a little longer than expected. The only challenge is adding the vents and control linkage since you did not have an a/c originally. But the instructions are good and customer support for questions on installation are good from either company. You will definitely enjoy the results of the installation when the weather heats up. You will be able to cruise and show off that beautiful pony in comfort. Thanks Bill - good info. Beautiful car also! Mine doesn't have the shaker, but was upgraded to a 4 speed toploader. The shop is adding disc brakes on the front, power steering, and a new clutch. It does seem to be good car and in overall good shape, They are going to take care of the appearance details after the mechanical stuff is done (such as replacing some badging, adjust trunk etc.). Really looking forward to it! I'm not a collector, and I plan to cruise around in the car - no daily driver but nice days, weekends, and alternating with the '13. I do want it to look original but the Vintage Air system looks pretty close - except the center vents are round instead of rectangular. Classic Auto Air makes a system also that has the rectangular vent. I'm just nervous about them cutting the dash, in general, but I think they've installed several of these. I'll verify that before I make the final decision. I suppose I could do it later also, but it depends on what type of price break I get for doing it now. The only bad thing is the weather is heading in the wrong direction, but it will be nice in the Spring. I just ordered a 4 pole lift from Costco (on sale for $1000 off) and that should come in handy for routine maintenance etc. They even install it for you! Thanks! - in calling a few places (BeCool, Griffin) it sounds like the aluminum ones are two row, but they actually cool better than a 3 or 4 row copper. I like the idea of re-coring the existing tank with 3 rows, I guess assuming that the tanks are in good shape. BeCool cautioned me about painting the aluminum ones because it can reduce efficiency if it clogs the fins a little. I'll know more once I hear back from the shop on what shape the original radiator is in. Thanks again for all the feedback, everyone. WOW! LOVE THE COLOR! SOUNDS LIKE YOU HAVE PLENTY GOOD ADVISE TO GO BY. I WOULD NOT REALLY HELP MUCH BECAUSE I DO NOT HAVE A/C IN MY 65, BUT I DO DRIVE MINE EVERYDAY. MY CAR USES A 3 ROW FACTORY STYLE REPLACEMENT RADIATOR, USING A HIPO FAN SHROUD AND A 5 BLADE FLEX FAN. MY TEMP STAYS AT A STEADY 190 DEGREES, UNLESS IN HEAVY TRAFFIC ON A REALLY HOT DAY. THE 3 ROW COPPER RADIATOR SHOULD BE FINE. FACTORY LOOK, TO ME, LOOKS A LOT BETTER THAN A BIG SHINY ALUMINUM RADIATOR. HOWEVER DO NOT GET A 4 ROW. I READ THAT TO MANY TUBES IN THE RADIATOR CORE CAN ACTUALLY CAUSE MORE HEAT. THE TUBES THAT CHANNEL INSIDE THE RADIATOR ARE SMALLER THAN NORMAL AND DO NOT PROVIDE ENOUGH COOLING. IF YOU DRIVE THE CAR OCCASIONALLY FOR STREET DRIVING, THE 4 SPD IS FINE, BUT THE 5 SPD OPTION IS WORTH IT. YOU CAN STILL GO THRU THE 4 GEARS ON THE STREET, BUT OVERDRIVE DOES MAKE HWY CRUISING A LOT BETTER AND SAVE A LITTLE ON FUEL ECONOMY AS WELL. AS FOR A/C, AGAIN IF YOU WANT IT TO LOOK STOCK, YOU CAN BUY ALL THE PARTS IN A CATALOG LIKE MUSTANGS PLUS, MUSTANG DEPOT AND SO FORTH. BUT THE MODERN A/C WILL PERFORM A LOT BETTER THAN OLD AND WILL USE A MORE UPDATED FREON FOR AFFORDABILITY AND AVAILABILITY. ENJOY IT! CONGRATULATIONS! WOW! LOVE THE COLOR! SOUNDS LIKE YOU HAVE PLENTY GOOD ADVISE TO GO BY. I WOULD NOT REALLY HELP MUCH BECAUSE I DO NOT HAVE A/C IN MY 65, BUT I DO DRIVE MINE EVERTDAY. MY CAR USES A 3 ROW FACTORY STYLE REPLACEMENT RADIATOR, USING A HIPO FAN SHROUD AND A 5 BLADE FLEX FAN. MY TEMP STAYS AT A STEADY 190 DEGREES, UNLESS IN HEAVY TRAFIC ON A REALLY HOT DAY. THE 3 ROW COPPER RADIATOR SHOULD BE FINE. FACTORY LOOK, TO ME, LOOKS A LOT BETTER THAN A BIG SHINY ALUMINUM RADIATOR. HOWEVER DO NOT GET A 4 ROW. I READ THAT TO MANY TUBES IN THE RADIATOR CORE CAN ACTUALLY CAUSE MORE HEAT. THE TUBES THAT CHANNEL INSIDE THE RADIATOR ARE SMALLER THAN NORMAL AND DO NOT PROVIDE ENOUGH COOLING. IF YOU DRIVE THE CAR OCCASIONALLY FOR STREET DRIVING, THE 4 SPD IS FINE, BUT THE 5 SPD OPTION IS WORTH IT. YOU CAN STILL GO THRU THE 4 GEARS ON THE STREET, BUT OVERDRIVE DOES MAKE HWY CRUISING A LOT BETTER AND SAVE A LITTLE ON FUEL ECONOMY AS WELL. ENJOY IT! CONGRATULATIONS! AWESOME! POST PICTURES WHEN ITS ALL DONE! AWESOME! DON'T FORGET TO POST PICTURES WHEN ITS ALL DONE!